After every Kentucky Derby, the question is inevitably asked: “Is this the year that another Triple Crown champion is crowned?” And every year — for 32 years — the answer has been the same: no. Veteran turf writer Steve Haskin seems to think so. “What can prevent [I’ll Have Another] from finally ending the Triple Crown drought?” Haskin asks in the May 10 installation of “Hangin’ With Haskin” at Bloodhorse.com. “This is going to sound sacrilegious and presumptuous, but the answer is nothing. At least nothing that he can control. Frankly, this colt has the sharp tactical speed to shorten up in the Preakness and the pedigree to relish the mile and a half of the Belmont. His fate could very well be out of his hands and that the only thing that can stop him is one of the Derby starters who were prevented from running their best race jumping up and running the race of their life at Pimlico or Belmont. And if I’ll Have Another should get by the Preakness, there will be a fresh Union Rags waiting for him at Belmont. Not surprisingly, I’ll Have Another’s trainer Doug O’Neill agrees with Haskin’s assessment. So, are Haskin and O’Neill right? Will I’ll Have Another become just the 12th thoroughbred — the first since Affirmed in 1978 — to capture the Kentucky Derby, Preakness and Belmont Stakes? Well, if history is any guide… no way, no how. Look, we learned in Louisville that I’ll Have Another can rate off of fast fractions and still finish (previously, I’d had my doubts), but what we didn’t learn was whether or not the Derby champ can run well on just two weeks rest. True, that’s an open question for nearly all the horses gathered at Old Hilltop — only longshot Guyana Star Dweej has ever wheeled back that quickly — but the question is especially pertinent in regard to I’ll Have Another, who raced exactly twice in the 243 days prior to the Run for the Roses. What’s more, I’ll Have Another had shockwave therapy in late April. And while the colt’s connections have treated this with the same degree of seriousness that one might approach a bar fight with Shia LaBeouf (“It's just a pulse that brings blood to an area,” explained owner Paul Reddam), the fact is shockwave therapy is a medical procedure — one designed, at least in part, to reduce pain. Now if a horse that raced only a couple of times in eight months prior to the Derby needed medical attention to stay fit and loose in Louisville, how confident can one be that he will be able to stay on the muscle in Maryland? The fact is every Triple Crown winner won at least one race other than the Preakness on 14 days rest or less during their sophomore season and only War Admiral failed to attempt a similar quick turnaround as a juvenile. I understand that training techniques are different now — starting more than once a month is thought to be highly ambitious — but, just like anything else, experience matters and I’ll Have Another simply doesn’t have any when it comes to racing on limited rest. 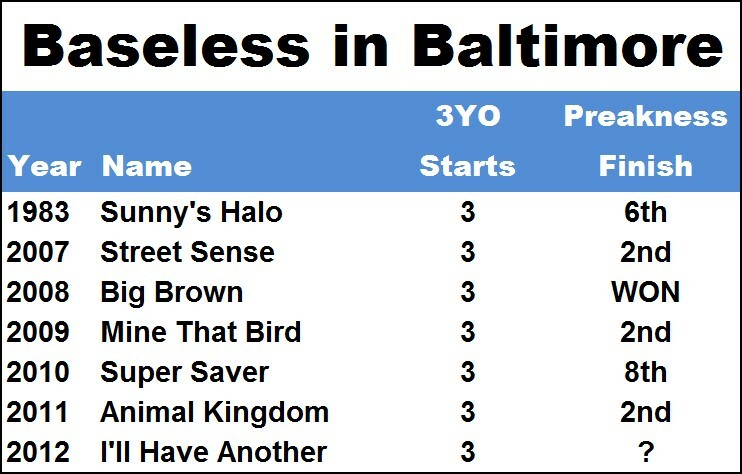 Although Derby winners have proven to be very potent at Pimlico, having captured the second jewel of the Triple Crown 29 times in 71 tries since the order of the Triple Crown sequence was finally set in 1932, only one of the past six Derby champs with fewer than four previous starts as a three-year-old managed to win in Baltimore. The one was Big Brown... and he paid a whopping $2.40. It also doesn’t help that trainer Doug O’Neill is zero-for-the-last-five-years (or more) when attempting to win a graded route race on two weeks rest or less, whereas his main rival, Bob Baffert, trainer of Bodemeister (the Kentucky Derby runner-up), is two-for-five during the same time period. 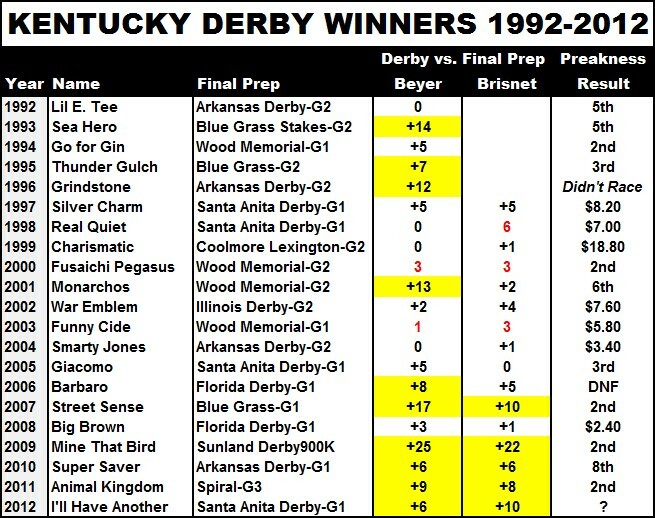 Though I’ve written extensively about the controversy regarding how fast last weekend’s Kentucky Derby actually was (see “What’s Speed Got to Do with It”), even if one accepts Beyer’s low 101 speed figure for the race, that number is still quite a bit higher than what I’ll Have Another recorded in his final pre-Derby prep (95 in the Santa Anita Derby). 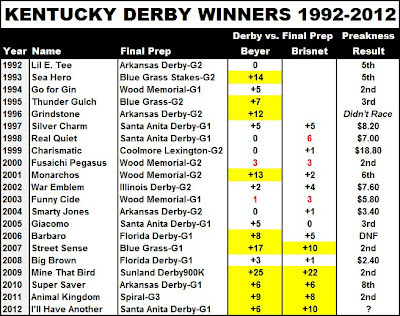 Since 1992, when Beyer figures were first featured in the Daily Racing Form, Derby winners that improved their final-prep Beyer by more than five points in the Run for the Roses are 0-for-8 in the Preakness. Using the same criteria, but substituting the Brisnet speed figures for the Beyer numbers, results in an equally abysmal 0-4 record. On the plus side, I’ll Have Another should get a great, stalking trip behind the likely pacesetter, Bodemeister. And if the “bounce” advocates are right and “Bode” bounces to the moon, I’ll Have Another should be in an ideal position to pick up the pieces late. Going hand and hand with the notion that returning to the races too quickly — within three weeks by today’s standards — causes horses unimaginable grief and stress, is the idea that rest and relaxation produces peak performances. 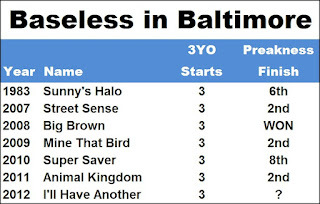 Well, apparently the “new shooters” in the Preakness Stakes have yet to receive the memo. It's all a matter of luck! Life is a game...and maybe all we need to do is to find the secret code for "success" and not to cheat. Great blog and podcast as always. Bode slaughters them for me...I hope he goes EVEN harder and destroys it. Have taken $3.20, and I think that's big overs, he's $1.75 in my mind. Go bode go, go Derek go! One of my favorite quotes (by Albert Einstein) is: “God doesn’t play dice with the universe.” In other words, there is an order to the world, a cause for every effect. Now, we may not always understand that cause — chess teaches us that, without the aid of computers, we can only identify and process so many scenarios — but that doesn’t mean that a cause doesn’t exist. However, I think trying to find a “key” to the mysteries of racing or the world is generally futile. Einstein, who I referenced above, spent the latter part of his life trying to unify the various laws of physics — to no avail. The fact is we can still predict certain events with a reasonable degree of accuracy without knowing every detail pertaining to that event. This is what meteorologists do and, in my opinion, it is what horse handicappers and sports gamblers should strive to do as well. It is luck. In the derby with 20 horses, it is first man/horse to find the hole usually wins. After that it is the belief in a horse. Not everyone has the same beliefs. You do a little research and listen to some experts and you end up with a horse you believe in. Although, having the right jockey is always a plus. Many Critics think that "I will have another" cannot win the triple crown. I think that for the first time in 32 years; they are all wrong. It is my expert opinion that " I will have another" will win the triple crown. Why? first, he can run short, middle and long distances very well. Second, He beat the best horses out of this race already, so it is the other horses the ones that have to improve performance. Third, I will have another won the Derby with a rookie jockie; this means that this horse is a freak, because it was not the jockey that won the race but the horse itself. Fourth, people like to see horses running in front and showing a lot speed like Bodemeister. However, the best horse is the one that finish first at the end of the race not in between and I will have another love to win races. Fifth, He ran better times than any other horse at every distance he ran during prior races. This mean he is the horse to beat. Finally, we have been waiting for a horse like " I will have another" to step up and win the triple crown. He have all the ingridients to get the job done such as speed, strenghts, stamina, and the will power to fight the race to the end. He will be very hard to beat for any other horse that doesn't have these skills. My choice to win the triple crown is " I will have another" then the fight for second place will be between Creative Cause, Went the Day Well, Bodemeister, Pretention and Cozzine.